On Thursday 3rd May 2018, MOTIONrehab’s Intensive Outpatient and Neurological Rehabilitation Centre was officially opened. The opening followed a series of events that were held for patients, family and friends, a media event followed by the industry launch event yesterday evening. 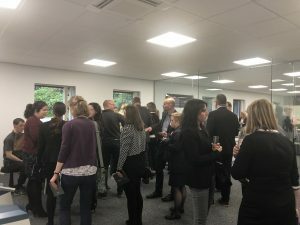 The industry launch event in Leeds was attended by over fifty case managers, solicitors, and healthcare professionals with a specialist interest in neurological rehabilitation. Over drinks and canapés, the attendees had the opportunity to listen to Clinical Director, Sarah Daniel’s vision for the new MOTIONrehab clinic, meet with the MOTIONrehab team, ‘have a go’ on all the new neurological rehabilitation technology and learn how high-intensity rehabilitation, augmented by robotics and virtual reality will optimise outcomes for people with neurological illness or injury. The new concept offers patients specialist hands-on therapy from experienced and highly skilled clinicians. Uniquely MOTIONrehab patients will also spend time training with the robotics individually and in groups. This allows high repetitions of movements which is critical to Neuro-plasticity and the optimisation of outcomes. MOTIONrehab are currently the only neurological rehabilitation centre in the country to offer outpatient packages of high-intensity rehabilitation of 80 hours of rehabilitation spread over 4-7 weeks. The response at the launch was overwhelmingly positive from all those who attended event. MOTIONrehab would like to thank everyone who attended the event last night and all those who have supported Sarah and the team along the way to turn this vision a reality. 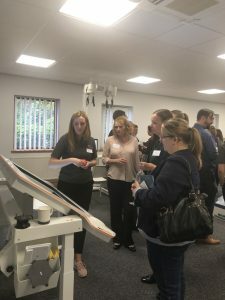 For anyone who was unable to attend any of the events, please do not hesitate to contact the MOTIONrehab team on 0800 8600 138 or email: info@motionrehab to book a visit to come and have a look around.